Often times, trees may have a so-called, ‘co-dominant’ branch that protrudes from the stump and offers the same size and weight as the main stump. When this occurs, it can leave the tree off balanced, tilted, drooping, or leaning. To save the tree’s integrity, cabling and bracing helps rebalance the tree and its co-dominant branch using tree cables and braces that are mounted into the ground and between trees to hold the tree at a desirable angle. While there is no set time on when you should consider having your trees braced or cabled, you shouldn’t wait long to have old and young trees assessed by a professional arborist. A certified arborist can advise you on the best methods moving forward to maintain the strength and integrity of your trees. Younger trees are not at as much risk but can benefit from early bracing or cable to help them grow in such a way that ensures they’re stability when they’re at full capacity. For older trees that have established branch unions, or the point where dominant branches meet, an arborist will need to determine the type of existing union and if it meets the requirements for bracing and cabling. Branch unions are the point in trees where the larger branches meet. When a union isn’t developed just right, it could lead to potential damages and cracks in the future, which could be compromising to your home or lawn, depending on where the tree is located around your property. While some trees may appear sturdy, this doesn’t mean they aren’t prone to some sort of accident in the future. 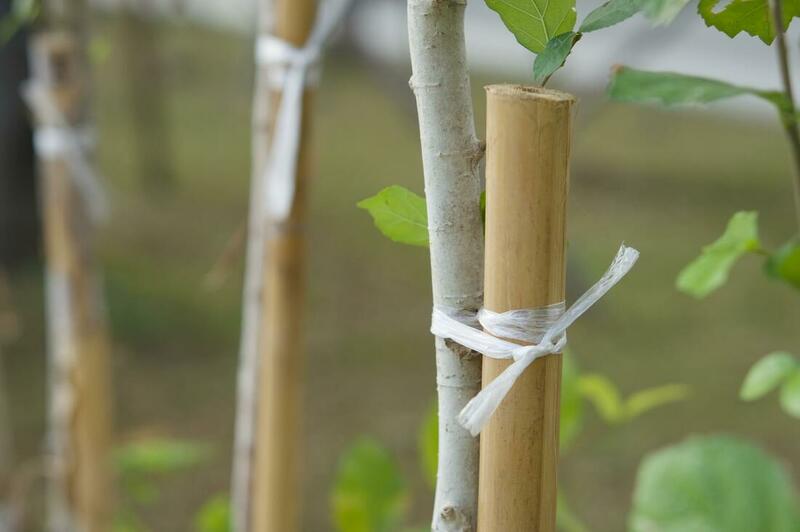 Therefore, bracing and cabling have their advantages as they are only preventative methods of tree care, but also security measures are taken to maintain the safety and integrity of your trees. Cabling uses metal cables to balance trees that have imperfections, unbalance weight, stress, cavities, or already-established cracks. The cables are installed using heavy-duty metal cables and bolts that are nailed into the tree’s trunk and attached to other, surrounding trees. The tension of surrounding trees accounts for the imbalance in the tree with the imperfections, extra weight, stress, or cavities, and helps center it back into place. Cabling is not only a way to secure flawed trees in place, but it works well for trees that have been affected by longtime problems and damage, without having to cut or remove them completely. Bracing is the technique of using metal rods implanted into the tree to hold together branches and branch unions. Braces serve as a reinforcement mechanism to areas of the tree where there is extra or added stress due to weight or a crack. The braces are drilled and added into the branches and sides of the tree to stabilize the area and realign the weight of the tree with tension, avoiding any form of crack. Bracing goes hand-in-hand with cabling as the two provide cohesive benefits to trees when performed together.